3 No, it did not happen! Iraqi police say a parked car bomb has exploded in Baghdad's northwestern neighborhood of Hurriyah, killing at least 10 and wounding 34. 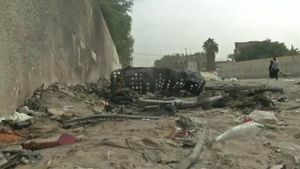 The bombing, which hit a popular fruit and vegetable market in a commercial street of the predominantly Shiite neighborhood, was the fifth such explosion in the capital on Sunday. A parked car bomb exploded in Baghdad's northwestern neighbourhood of Hurriyah on Sunday, killing at least 10 Iraqis and wounding 34 others, police said. 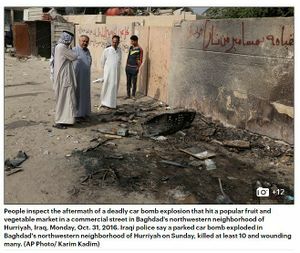 The bombing, which hit a popular fruit and vegetable market in a commercial street of the predominantly Shia neighbourhood, was the fifth blast of the day in Iraq's capital. The deadliest — a parked car bomb — hit a popular fruit and vegetable market near a school in the northwestern Hurriyah area, killing at least 10 people and wounding 34. IS claimed responsibility for the attack. The video footage is not yet geolocated (verified) as being from Hurriyah, or from the right day. 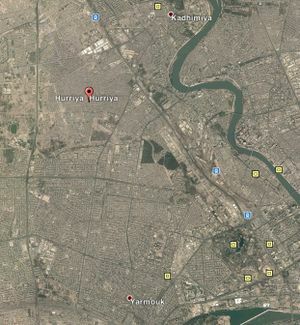 It might be hard to find a match, with apparently two or thee areas to consider, all in the basic area indicated on this map: Hurriya 1 Wikimapia (primary E-W street angle = 113 degrees) Another Hurriya 1 to the north (primary angle 117 degrees). Just to the west of these is a much larger area Google Maps calls Hurriya. Wikimapia breaks it into numbered areas with Arabic, but running across the middle of them is Al-Huriyah main street. The primary E-W angle here is about 84 degrees. A street market in the first mentioned Hurriya 1 is described as "The first market for fruits and vegetables" on wikimapia and "first popular market" on Google Maps. An analysis by Christiaan Triebert at Bellingcat offers a fairly good geolocation: here on Wikimapia on the western end of that main street. The street in question seems to have no markets (ore rlated activity) in the video, and is in fact between two scools in a long row of them; by Wikimapia labels, Glory primary school is to the south, martyr Eadil to the north. No, it did not happen! YouTube playlist ordered chronologically by time of video uploads. Two of the videos on the list are first posted by an al-Nusra Front linked channel "Baghdad Two Years". There is some reason to believe the staged scene described above happened after the the attack and thus constitutes a re-enactment. If a fake scene is arranged in the same spot afterwards, this suggests some other kind of fakery, and suggests, but doesn't prove, that the earlier claims were true after all. For an explanation, see talk page: Double-Fake by ISIS Supporters?